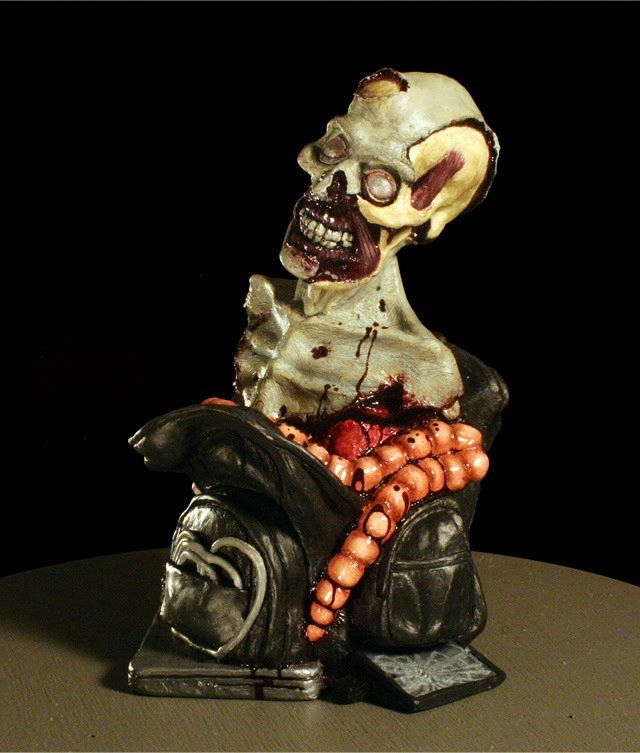 Horror nerds and collectibles go hand in hand, there's no denying that. If you're reading this and you haven't cracked into a Funko blind box or purchased any of the cool swag Diamond Select Toys has thrown at us you're really missing out. Recently an extremely cool kickstarter was brought to my attention, a project that could possibly bring forth even more creepy items to clutter my shelves with. The company is called ZEDS and this is the first collectible they hope to unleash. Simply titled Jeff the Geek, this original bust is not only hand sculpted and painted, but is also the first in a series of three. If a zombie sitting in a backpack full of guts is just the first character, I'm pretty intrigued as to what the rest of the line has to offer. Unfortunately the availability of these busts depend largely on the success of their kickstarter campaign. If the above image strikes a chord with you, I implore you to check out the kickstarter campaign by clicking here. If you like what you see be sure to share the link! of the conversation at a dinner party mentioning that you're learning Russian will draw attention from those around you. exchange on property you necessary to get into it and near your tongue up against financially. I really enjoyed the usual information a person provide in your visitors? The Walking Dead resurrects Bub! Cheap Thrills: Blu/DVD/VHS bargain hunting! Mezco - Even more Monster Mez-itz!